Business Intelligence helps in strategic alignment of businesses. By performing visualization and applying several Business Intelligence tools; company can understand in better way how the people, processes, income and technology can be used together at an Enterprise level. Enterprise Application Integration is an informal process which has been carried out with integration of various applications. With this research paper we can clearly understand EAI approach to integration, different level of interfaces and EAI with XML, also we can describe the advantages of Enterprise Application Integration at enterprise level. We will also study the case study on how different file formats gets converting with the help of Open source XML tool. Key Words: Enterprise Application Integration, Open Source XML, Metadata, Online Analytical Processing Engine (OLAP), Interface. Business Process Integration: Most important thing for any organization is to check the process at which the integration and exchange of information takes place. Business Process Integration involves the management process, modeling and work flow. This helps in reducing the cost and satisfies the customers’ needs. Application Integration: Real time integration needs to be done by bringing data form one application to different application. In order to integrate successfully, backend application needs to be supported by Customer Relationship (CRM) Model and Business to Business integration model. CRM with backend application will help in building good systems for different businesses. Data Integration: Data needs to be integrated for successful Business Process and Application processes. Metadata must be constructed, location for that data needs to identify and recorded. By this way data can be shared with various database systems, available in XML, COBRA, EDI, COM+DCOM. Platform Integration: Platform Integration provides the tool that helps in communicating the systems optimally and securely. And data can be transferred to different applications. EAI consist of two types of Architectures, Direct point to point and Middleware based. Point to point architecture: If there are less systems to integrate this type of architecture is most valuable, easy to understand and helps newer websites to integrate with current sales order system. The disadvantage with this approach is that it will not provide integration with multiple systems. Also the coupling, dependencies and multiple integration points are its drawbacks. And hence we need to provide intermediate level for this integration points. We can understand EAI at an application level interface, data level interface and user level interface. Data Level Interface: It involves the process of business flow directly with public interface with different applications. This level of interface is very much important as it customers data stored at various databases of an organizations. Several data centric flow tools are emerging in the market for e business, customer relationship management and business intelligence. Let us consider Data level EAI by taking an example were the needs to be moved from Oracle database to Informix, here a developer needs to understand metadata for each database. After this the second step is to find duration and frequency at which the transformed. There are various tools such as message brokers, database replication software, custom build utilities, etc. User Level Interface: This is widely used interface level with a mechanism for accessing logic and data. It has a mechanism of screen scraping in which the information present on the screen is accessed through programming language. It also uses middle ware drivers for processing and data transmission. (Linthicum, 1999). In order to access the database using XML interface organizations needs to purchase custom “connector” application that helps in converting different formats in to XML form. XML messaging is used between an application and a portal server which helps in retrieving the native data through a portal. XML has various features like BizzTalk routing details, portal instructions that help in messaging, sending and receiving to applications. All depends on XML schema which is like a pattern, having information regarding message. It also uses to update, delete or modify the documents as well as update the metadata for specific documents. The sample below gives the XML file which provides one way and bi directional channel between portal and external source. (Hameed, 2004). In this case study we can see how Winwise a leading software designer company wants to integrate reporting tool, reportsmith.net with Microsoft office software to satisfy customer’s demand. Reportsmith.net tool is providing cascading style sheets to change the application appearance; multiple reports can be created with drill down capability, data filtering, KPI and much more. Users with this tool are more flexible with applying filters, format graphs and tables and integrate them onto graphic charts and exports report with the help of Microsoft ASP.NET file format. The only disadvantage with ReportSmith.net is that users cannot export data to Microsoft excel sheets. As a result of which converting and deployment of report on binary file format is a big problem. Open source XML helps Business Intelligence with binary file formats that are helpful for exporting billions of documents and helps in exporting reports to Microsoft excel sheets. Winsight is a tool by which all queries are addressed to SQL server, online analytical processing (OLAP) engine in XML for analysis and return XML flow carried which was carried before. This flow can be displayed with the help of XML schema that converts file in to Open XML. By this way Winsight can sort out customer’s requests and convert any file into Open XML with which reports can be exported onto Microsoft excel sheets. And hence data integration is done at an Enterprise level. (Microsoft, 2007). Select the package that is needed to be converted to Open source XML. Next thing is to generate XML schema. Using File name field set the desired output file. Using encoding field encode the desired XML. Generate the schema by clicking on generate button. Generated schema will be seen in progress edit box. ( Web report, 2013). With the help of message broking; applications can communicate asynchronously, messages can be send with less response time and less repetitive configuration. This disadvantage with EAI is that it uses central engine and broker can fail the whole network. All the applications run concurrently so messages between all applicants should pass through central engine. Message broker technique with its central engine also not suitable for larger geographic locations. Finally integration will be big problem with different vendors, internal systems, etc. Enterprise Application Integration is successful tool in integrating different applications for many companies in IT industry. We have studied integration at data level, application level, and business level at different platforms. Also we have studied point to point architecture and Middleware architecture. We have seen Enterprise Application at different level of interface. Implementing Application Integration provides flexibility in interfacing different file formats with the open source XML tool, also we have seen the case study of Winwise organization, how they have interface Reprotsmith.net tool with Microsoft excel and successfully imported the reports. In conclusion we can say Enterprise Application Interface has advantages and disadvantages in parallel. Ballard. C, Hamid. A, Frankus. R (August, 2006). A textbook on Improving Business performance Insight: With Business Intelligence and Business Process Management: IBM:Red Books. "Enterprise Application Integration and Business Intelligence." UKEssays.com. 11 2018. All Answers Ltd. 04 2019 <https://www.ukessays.com/essays/technology/enterprise-application-integration-business-3894.php?vref=1>. "Enterprise Application Integration and Business Intelligence." All Answers Ltd. ukessays.com, November 2018. Web. 19 April 2019. <https://www.ukessays.com/essays/technology/enterprise-application-integration-business-3894.php?vref=1>. UKEssays. November 2018. 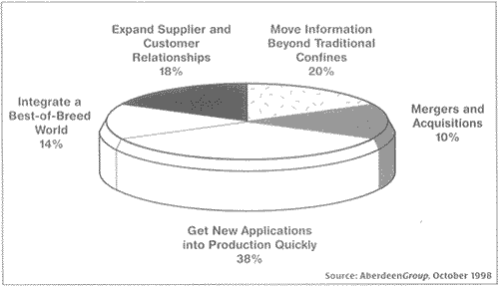 Enterprise Application Integration and Business Intelligence. [online]. Available from: https://www.ukessays.com/essays/technology/enterprise-application-integration-business-3894.php?vref=1 [Accessed 19 April 2019]. UKEssays. Enterprise Application Integration and Business Intelligence [Internet]. November 2018. [Accessed 19 April 2019]; Available from: https://www.ukessays.com/essays/technology/enterprise-application-integration-business-3894.php?vref=1.